Replacement or add-on tubes for your Tubeology system. These small aluminium tubes are ideal for large brownies, trout and low water salmon fishing tube fly patterns. Replacement or add-on tubes for your Tubeology system. 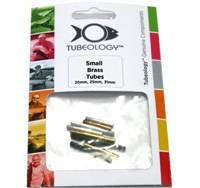 These small Brass tubes are ideal for large brownies, trout and low water salmon fishing tube fly patterns. They are slightly heavier than the Aluminium tubes.